So upon arriving in and further exploring this part of central France, we learn that the local wine is called Malbec, “the Black Wine.” We become curious and do some investigating. We must ‘drink local’! Research must be done! The first thing we learn is that the Malbec grape is indigenous to this area. Al and I have observed that this area of France is reminiscent of California wine country—a sunny, rather dry climate, with rolling hills punctuated by tree-lined lanes and scrubby native plants; the soil is alkaline (white dusty limestone on the hilltops, we observe). Presumably the section of Argentina devoted to grape-growing is similar. The Black Wine continued to be favored. It was featured at the marriage of Eleanor of Aquitaine and Henry Plantagenet. (Cue scenes from “A Lion in Winter.”) Its popularity spread throughout France and indeed all of Europe. Peter the Great “imposed it upon the Orthodox Church.” Heavens. 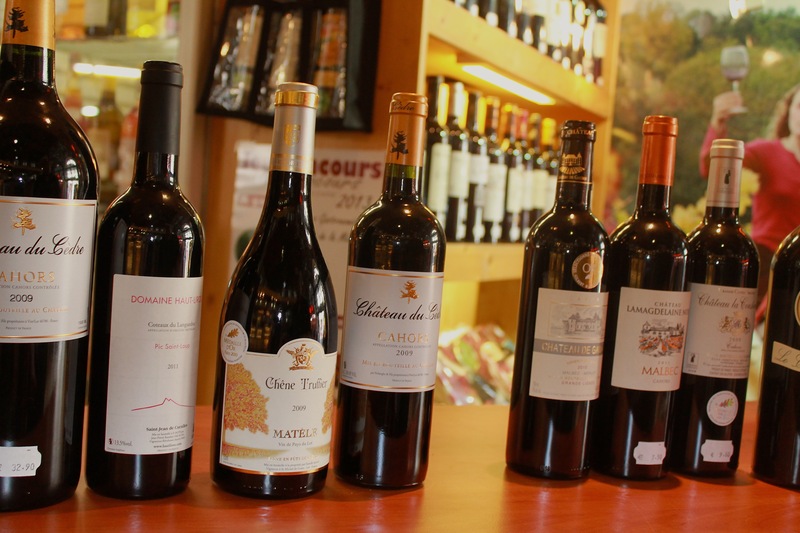 A ferocious rivalry between this area and Bordeaux ensued, including unfair export taxes! Then, in the 1865 growing season, disaster struck in the form of the dreaded phylloxera. Cahors vines were wiped out. Now is the task continues to put this area back on the map, and take back the Malbec flag, so to speak, from Argentina. We’ve noticed signage about Malbec wines throughout the area, for wineries as well as “caves” (which are wine shops). When in the city of Cahors yesterday, we could not fail to notice the abundance of tourist literature, posters, signs, and attractions related to this regional wine renaissance. (The story I recount here is cobbled from some brochures and booklets.) 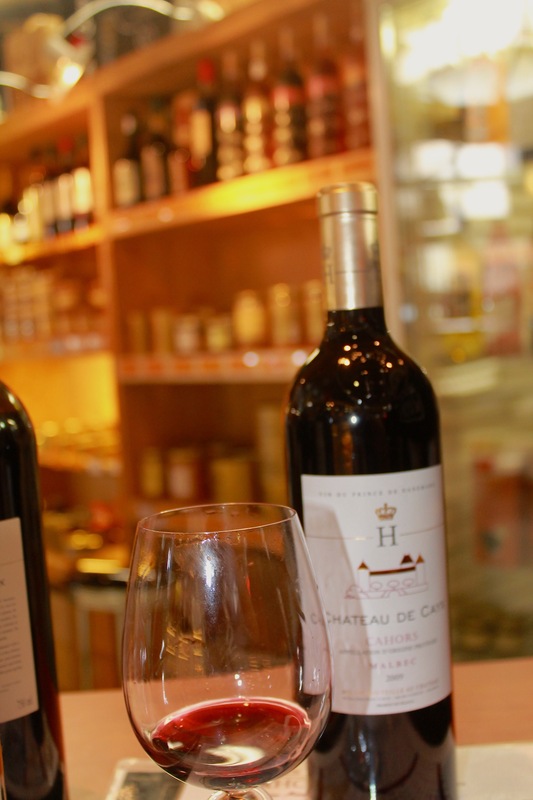 Right downtown, adjacent to the Tourist Bureau, is the swanky Cahors Malbec Lounge, a combination of bar and cave that welcomes, educates, and seduces visitors. We learn that 2005 was a banner year, but that 2009 is also very wonderful. Our hostess at this little hilltop B&B urged us to get a bottle of her favorite, Chateau de Haute-Serre, 2009. The vintner there, one Georges Vigouroux, is evidently a rock star around here. But a charming man at a Cave near the Pont Valentré urged on us a bottle of Chateau de Cayx, 2009, explaining that the rich owners of that property, Queen Margarethe and Prince Henrik of Denmark (! ), had hired their own rock star winemaker and we would be “very delighted.” We also got a rare 2005 bottle from yet another source, Chateau de Chambert. Please note that we spent between 10 and 20 euros per bottle: bargains. Tasting and comparing these Malbecs will require patience, fortitude, and good will, we decide. We will bring them with us tomorrow when we go to visit Al’s good friend to the south of here, Jean-Louis. We get by with a little help from our friends. We will report back. Notes of cherry and kirsch aromas with a delicate roasted flavour. A truly majestic Cahors with silky tannins. This exceptional wine was created in honor of Her Majesty, Queen Margrethe of Denmark, to celebrate the occasion of her 70th birthday. For now, however, we can report on our research on the non-bottled “country” Malbecs, purchased—really and truly—from what looks for all the world like a gas pump. We have been drinking these with our meals, usually in the back garden here at the B&B. I will let my sommelier Al tell this part…. 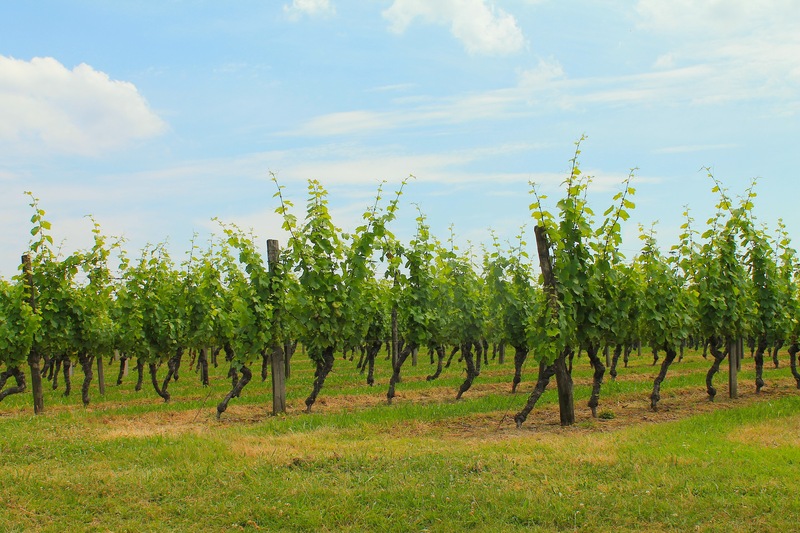 American connoisseurs tend to endlessly discuss particular vineyards and particular vintages and set great store by a particular bottle in their cellar. The French do that as well. For example, here in Cahors, it is generally conceded that 2005 was a marvelous year, but the 2009 will, in the due course of time, age better and will be even better. However, if you are looking for a year to open up a bottle for supper tonight, probably 2008 in the year to look for. I’ve noticed that while a bottle of 2005 is hard to find, and will go from 10 Euro to 45 Euro, the 2007 vintage is widely available at anywhere from 3 to 12 Euro tops. Presumably for good reason. But what is interesting to be as the galloping gourmand and anti-wine snob is not what people write about but rather what they do and what they drink. A little research on the internet confirms my observation that 60% or so of the locally produced wine is sold in bulk, out of gas pumps. The local folk drink it daily, drink it at Bastille Day festivals, and if you go out to a local restaurant and have a glass of wine with your meal (did I write “if?”), you’re drinking the gas pump wine, too. It’s been aged in a steel tank for hours. The notion of drinking a wine that isn’t really dark red but actually is almost black, straight fresh with little or no aging might be either daunting or appalling to most Americans, but indeed this is how the people who make this stuff mostly drink it, so a wine tasting comparison of these rough and hardy table wines is pertinent…The Battle of the Bulks. 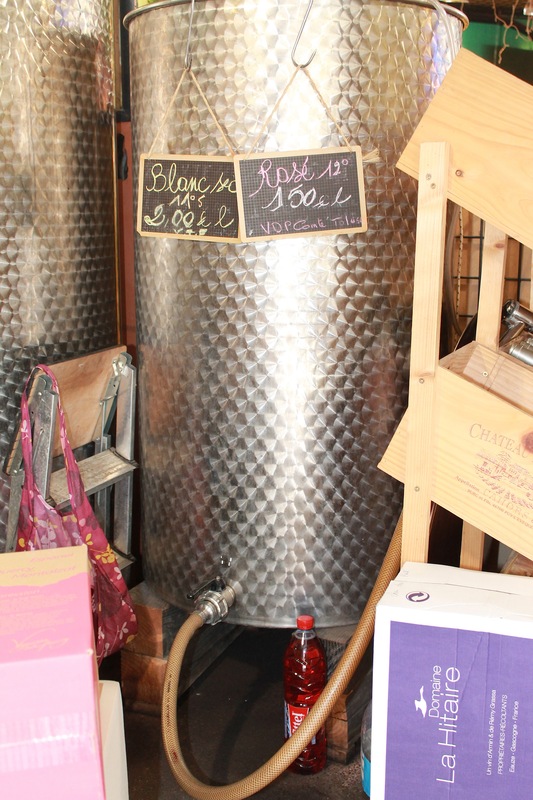 Bulk wine can be purchased locally in two broad types….First, a type called “Quercy” named after the local region. This tends to be a blend upon a base of roughly 50% Cabernet Franc, I think, with various percentages of Sauvignon, Malbec, and Merlot comprising the rest. The other bulk available locally is the 100% Malbec. Now, bottled and labeled Malbec comes in three broad ratings, Traditional, which must be at least 70% Malbec, Superior, which must be at least 85%, and Prestige, which must be at 100% Malbec. Modes of dispensing “country wine.” You can bring any container you wish, recycled water bottle, jug, barrel, whatever. 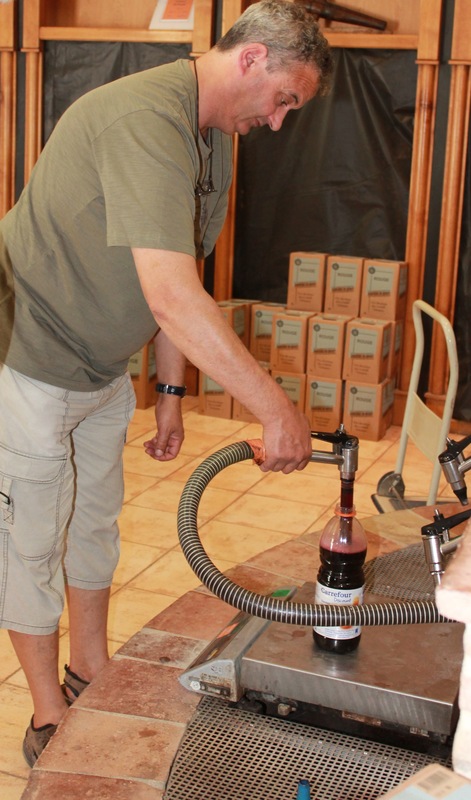 Now, the bulk Malbec we are testing is a 100% as well, but, again, a gas-pump bulk wine, 1.50 Euro per liter at the pump, BYOB, or barrel or keg, as the case may be. Clearly not the same as the Prestige stuff. Color. Indistinguishable. Both almost entirely black with just the slightest hint of purple shading. To call either of them Red would be incorrect. Mouton-Cadet is dark red. This stuff is, truly, almost black. Nose. Huge difference. The Quercy blend smells just like you might expect. Very strong, very acidic, very in-your-face. The 100% Malbec almost is unscented in comparison. Grapes, yes, but also, well, earth. Le Terrior. But very subtle. Taste…both were opened and aired for over an hour. Even so, both hit you like a ton of bricks with their acidic taste (FWIW, I generally prefer whites for this very reason). But they are very different. The 100% Malbec has a very high pitched acidity, which is extremely strong at first but fades away after a few seconds on the tongue, and the taste that remains is more earthy than fruity. The Quercy blend, on the other hand, has a lower pitch of acidity, but it remains there the entire time, not going away, but the background is more fruity, with hints of plums, currants, and yes, even grapes. Teri and I both preferred the Quercy blend. I guess wine isn’t like whisky. I tend to prefer unblended whisky, and do not drink blends. With wine, I suspect that insisting upon 100% of a certain grape does not give the winemaker room and leeway to experiment and do their thing, to mix and hopefully make a bit of magic happen. Buzz. Both wines produced a nice pleasant, happy cheerful buzz. And that, is, in my opinion as your Surveyor, the best recommendation I can give. As for this prejudice about wines made by blending wines from different varieties of grapes, that seems so … German/Californian. You’re in France where what matters are the results. The sort of enjoyable complexity and balance that can be gotten by blending may not pass some intellectual test, but the palate knows the difference. Teri, you’ve left an important part of the story out completely. Texas saved the French winemakers. Yes, Texas. It was T.V. Munson, to be specific, who figured out how to graft the classic French varietal vines onto phylloxera-resistant rootstocks. Somewhere in Texas, the grateful French erected a monument in his honor. Al, what recommendations do you have for pairing Malbec with food? Would it go with a hearty pasta?